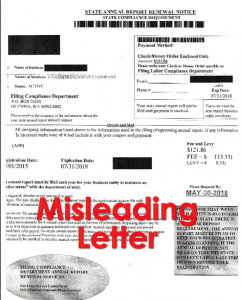 It has come to our attention that there are misleading and potentially fraudulent mailings that look to be an official bill related to business registration requirements from the Washington Secretary of State's office. Although the Washington secretary of state is working with the attorney general’s office to see what actions need to be taken in order to protect businesses in Washington, we want to help spread the word. If Horenstein Law Group currently serves as your registered agent, you need not worry about this, since these scam letters will come directly to us. The mailings being sent request that the business send $121.86 to an Olympia post office box by a certain date and warns that your annual report will not be filed until the payment is received. The mailing does not mention the “Office of the Secretary of State” or include its logo, which is found on all official correspondence. A sample of what the mailing looks like is above. The secretary of state's office suggests that if you receive such a notice, you should contact the attorney general’s Consumer Protection Department or file an online complaint here.